Tim Cywinksi, Communications Director for non-profit organization Virginia 21, excitedly pulled out his phone to show me a video. “Here’s the line…” he said, enlarging the video and turning the volume up. The video panned over the line of VCU students outside their polling place near the campus, waiting in the dark, at 7:45 AM on Election Day. The line extended for four blocks. All the people were chatting over someone in the line blasting Beyoncé’s “Love On Top”. (Never too early for Beyoncé?) “I didn’t mean to have a soundtrack over this…” he laughed. He goes to the middle of the line to ask people how long they’d been there: two and a half hours. Though long wait times and busy polling places aren’t uncommon, Cywinksi pulled this video up because showing people that millennials aren’t just entitled, lazy leeches is one of the main goals of Virginia 21 and a personal goal for himself. Only 26-years-old, Cywinksi thinks himself a prime example of how millennials do care about political issues and are willing to put the work in to make sure that their perspectives matter to legislators. As young as he is, his career’s been expansive: from getting he's worked to combat antibiotic use in factory farms and helped to secure an additional $50 million dollars in financial aid from the state budget last year. But the overarching goal here for him making sure young people understand the power they have: that’s where Virginia 21 comes in. “It started from a coffee shop conversation at William and Mary. It was a few students who noticed what was going on at the state level, noticed that these legislators were making decisions that directly affect young people, and yet, we’re not being consulted. We’re not part of the decision making process,” said Cywinksi. These students started reaching out to other universities in efforts to band other like-minded young people together. Every time there were budget proposals, the students would basically Batman signal other students from across the state to unite and ensure that legislators knew they were there, that they were paying attention and that they weren’t going to sit idly by. The coffee shop talk built up into VA21 as we know it today, with a small staff to handle the workload while students are busy with school. 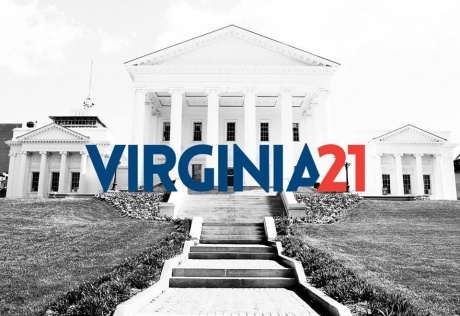 The students make their voices heard via university chapters, and VA21 turns it into a workable plan. The Richmond-based nonprofit’s main goals are primarily state-level, which include keeping college affordable, ensuring job’s for college graduates and empowering young people to get involved in politics, most commonly by voting. And they’ve seen many legislative - and creative - successes. One of their most prominent projects was the Pass the Buck campaign, where students collected 200,000 pennies - or 1 ton - and presented them to the state treasury. Each penny represented one student that wanted the General Assembly to invest in higher education. By the end of the session, legislators invested around an additional $275 million because of it. More recently, they’ve been present at the last General Assembly session. You can find Cywinksi lobbying on the behalf of millennials full time. And you can find actual students there, too. Zoe Craig is the Communications Assistant for VA21, as well as a student at VCU. When she heard about this legislation, she knew she couldn’t sit by and watch it happen before her. So she and another VCU student took initiative, marched down to the GA, and testified against the legislation for three minutes. Millennials are now the largest generation of people in the country, surpassing the baby boomer generation. That comes with a lot of potential political power. VA21’s mission is to ensure that they're properly represented, and a way of doing that is ensuring that they’re nonpartisan in their goals. As an advocacy group, the direction their work takes depends on what millennials say is important. After all, college affordability and voting are things that can affect young people across party lines. And he may be right: according to a 2014 Gallup poll about age and party affiliation, about 1 in 5 people aged 18 to 40 are the least likely to affiliate with any party or even lean towards one. However, the Democratic party still has the voting advantage, as it has historically. The lack of party affiliation, according to the study, may be symptomatic of our “distance from the political system” to begin with - and not necessarily because they're moderates. And 30% of the group still identifies with or leans towards the conservative side. According to Andrew Brennan, president of the University of Richmond’s Young Conservatives group, the primary concerns of right-leaning students primarily have to do with second amendment rights, the freedom of free speech, and social concerns like abortion. But where do they overlap is the economy and job security for graduates. UR Young Conservatives, however, don’t do much legislative work to push their concerns. While this group is a very, very small part of the overall picture and can’t represent all young conservatives, it does show us that some young people may still need some help getting their voices heard. VA21 hopes to bridge these political divides and narrow in on those overlapping concerns. When you’re broke and can’t get a job, it doesn’t matter on what side of the party line you fall on. And if you’re a student at VCU and want to get involved in their chapter there, you can visit their other Facebook page for more information.